An injury to the brachial plexus, the web of large nerves that exit from the spinal cord in the neck and direct the movement and sensation of the arm and hand, can cause life-long immobility without proper and timely diagnosis and treatment. HSS surgeons have been refining treatments and diagnostic techniques for this condition, including nerve repair, transfer, and advanced microsurgical reconstruction, for more than a decade. As their clinical and research successes have become nationally known, more patients from across the country seek their help following injuries ranging from motor vehicle and sporting accidents to falls and gunshot wounds. HSS specialists have now joined together to form the Center for Brachial Plexus and Traumatic Nerve Injury, providing a comprehensive and coordinated treatment experience for those suffering with these devastating injuries. The Center team will offer specialized care, develop new and improved approaches to treatment, and conduct pioneering research. 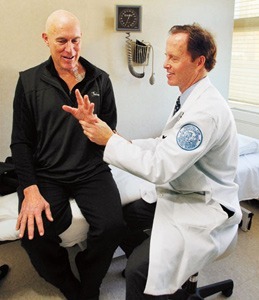 "Early diagnosis and care, ideally within three to five months after injury, will greatly improve a patient's chance for recovery," says Scott Wolfe, MD, chief emeritus, Hand and Upper Extremity Service and director of the new Center. Dr. Scott Wolfe examines Bermuda attorney Wendell Hollis several months following brachial plexus surgery. During an initial evaluation, physicians use electrodiagnostic testing to study nerve and muscle function and glean information about the patient's specific injury, learning if the damage is complete or partial, and whether or not the injury may be reversible through surgery and rehabilitation. Often, high resolution imaging studies are used to pinpoint the location of the injury, and the presence or absence of injuries of the nerves connected to the spinal cord, called avulsion injuries. Following surgery, electrodiagnostic testing is used to monitor nerve and muscle recovery. "This testing lets us accurately pinpoint the injury, quantify the degree of nerve damage, and helps to provide a clear diagnosis, which will help guide treatment," says Joseph Feinberg, MD, physiatrist-in-chief and medical co-director of the Center. Not every patient with brachial plexus injury requires surgery. Minimal data now exist on the long-term outcomes for brachial plexus surgery. "With a greater understanding of these injuries, we can help improve treatment and recovery for patients," says Steve K. Lee, MD, who recently joined HSS to become director of research for the Center. Specialists at the Center use the clinical and research capabilities at HSS to continually refine and improve diagnostic and reconstructive options for patients. Dr. Lee and Dr. Wolfe recently presented two studies at the XVII International Symposium on Brachial Plexus Surgery, finding that clinicians do not have a standardized way to report outcomes of brachial plexus surgery, making it difficult to compare the benefits of different surgical treatments. "From this work, we have determined that there is a need for a standardized outcomes measurement system or tool," says Dr. Lee. The Center is establishing a registry to enable surgeons to evaluate patient outcomes and improve management of these complex injuries. Learn more in HSS's biannual publication, Discovery to Recovery. Dr. Wolfe is the Director of The Brachial PLexus and Traumatic Nerve Injury Center at the Hospital for Special Surgery. Dr. Wolfe performs a nerve transfer surgery. Adult traumatic brachial plexus injuries can have devastating effects on upper extremity function. Although neurolysis, nerve repair, and nerve grafting have been used to treat injuries to the plexus, nerve transfer makes use of an undamaged nerve to supply motor input over a relatively short distance to reinnervate a denervated muscle. A review of several recent innovations in nerve transfer surgery for brachial plexus injuries is illustrated with surgical cases performed at this institution.